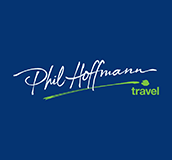 Phil Hoffmann Travel signs on again | Hahndorf Bowling Club Inc.
We are pleased to advise that yesterday, Phil Hoffmann Travel, Stirling, renewed their sponsorship with greater involvement in our Club. They have added the naming rights to our Ladies Pairs Championship, playing in our social night bowls next month and supporting other activities when they become appropriate. In return, we request members utilise their services when travelling, whether it be local, interstate or overseas. We receive a percentage from the value for each financial year that goes back into our finances. It is important that we support them by promoting PHT to family and friends. All that is needed is to advise their consultant you are from the Hahndorf Bowling Club. Sylvia and Graham Evans have been using their services over the past four years and found them to be excellent. Other members have also commented on their quality service.